The Coalition recognizes that online training programs are able to effectively teach basic life support (BLS) and specific life guarding skills to students and provide lifeguard certifications in an effective manner. Online programs are able to cover the same content as face-to-face trainings with increased flexibility and availability. The skills, strategies, and procedures covered below are known to be effectively taught both face-to-face and web formats. The Coalition report identifies scanning as a benchmark lifeguarding skill. Although there is no specific training standard associated with the skill, it is declared that practice improves the lifeguard’s ability to detect targets across the entire vision field, rather than focusing on the small area in the center and ignoring areas to the left and right of the center of vision. Focus on the use of head movement, with instructor observation and feedback is a key component of lifeguard training. Lifeguards must display vigilance while on duty. This means that the lifeguard must by ready to detect and respond to minute changes in swimmers’ behavior. 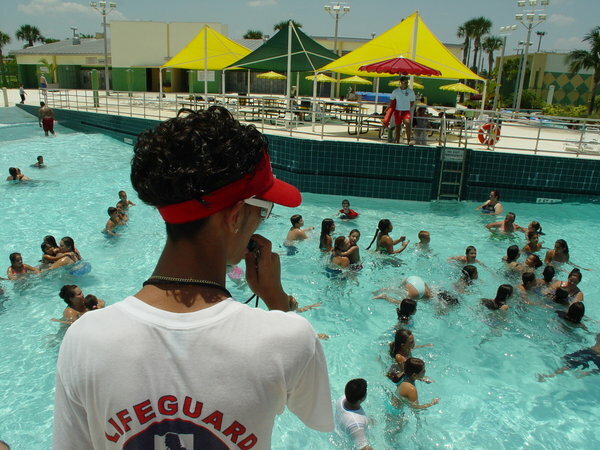 A certification program should cover behaviors that decrease a lifeguard’s ability to maintain vigilance, such as extreme temperatures, loud noise, and sugary beverages while focusing on ways to increase vigilance. Being well rested, consuming caffeine if needed, and receiving regular encouragement have been shown to improve lifeguard vigilance. In-attentional blindness is another concern for lifeguards. It occurs when a lifeguard is distracted by another swimmer or event happening in front of him. The lifeguard focuses his vision on one thing and tunes out the surrounding swimmers and happenings. Although the research failed to identify ways to prevent this blindness, the report highlights the need to educate lifeguard of its existence and the need to use diligent surveillance as prevention. Lifeguards need to be able to identify swimmers who are at a higher risk for drowning. Although some studies point out specific age groups, genders, or ethnicities as risk factors, no common patterns were found across history. Instead, one element was identified as a common cause of drowning: alcohol consumption. Lifeguard certification programs should explain the link between alcohol consumption and drowning and encourage policies that prevent those under the influence of alcohol from entering the water. Studies showed that a lifeguard’s vigilance is reduced over time. The longer a lifeguard is required to scan an area, the greater the reduction in vigilance. Although different studies showed different losses over varying time frames, it has been shown that lifeguards need to monitor their alertness and take periodic breaks. By stepping away from scanning and allowing for a rest period, a lifeguard is able to restore his vigilance and be better prepared to monitor the swimmers. Lifeguards must know how to open or maintain an airway in a drowning process victim. The ability to quickly open the victim’s airway and provide rescue breathing is critical to preventing a drowning fatality. Lifeguards must be trained and able to open an airway in the water with or without the use of a flotation aid and once the victim is on land. 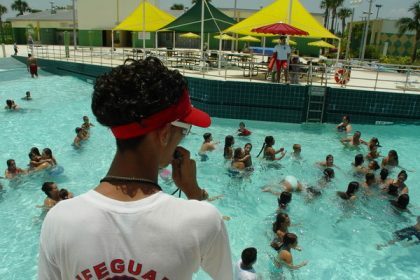 Lifeguards should also master techniques to prevent vomiting of swallowed water. Some lifeguard certification firms may train life guards in the use of manual and electric suction devices to clear the victim’s throat, but this is not a necessary component of the certification process. A lifeguard should know how to prepare a victim for transportation to a hospital in a manner that protects the airway. Drowning incidents may be accompanied by spinal injuries. When a spinal injury is possible, due to accidents related to diving, water skiing, surfing, or other activities, lifeguards need to modify their rescue strategies to protect the spine. At the same time, a lifeguard’s energy can be wasted on protecting a victim’s spine when a spinal injury is unlikely. If a spinal injury is suspected, establishing a clear airway takes priority over stabilizing a spinal injury. Once the airway is open, the victim can be immobilized on a spine board for transport to a hospital. Lifeguards can use supplemental oxygen during a rescue, as long as its use does not slow the pace of the rescue. Immediate attention needs to be given to establishing an airway and rescue breathing. In addition to these skills, a lifeguard must have competencies that go beyond the classroom and prepare the rescuer for situations encountered in the water. The skills discussed below are suggested as water-related standards that all lifeguards should master. These requirements are only the beginning of water rescue competencies. Site managers may design tests that include additional components, such as multiple victim situations, navigating strong surf, or using floatation and rescue aids. Lifeguard certification should cover the basic components and offer participants the option of studying advanced rescue techniques in order to provide certifications that prepare guards for rescues in a variety of environments. Lifeguard certification is a process designed to prepare a person to work in a situation when water related accidents are possible. The skills and standards listed in this article describe the foundation skills that certification depends on and the types of things a lifeguard will need to know how to do once employed. In addition to the skills discussed above, a lifeguard may need basic first aid skills and techniques for sharing safety guidelines with swimmers in the water. No matter of the swimming expertise of the lifeguard, the working environment desired, or types of swimmers that a lifeguard will encounter, CPR certification is the first step to employment and confidence in one’s ability to save a life.